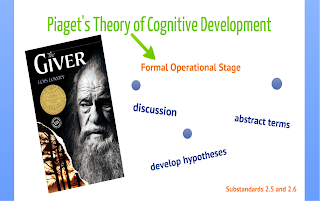 Although each individual experiences each of these stages at a different time in their life, I believe middle school educators are most likely to encounter students in Piaget’s final stage, the formal operational stage. In order to implement this theory into a middle school classroom teachers must require students to participate in group discussions. One novel that would prove be very effective in this particular activity is The Giver. This novel describes a futuristic society unlike anything currently in existence. After reading several chapters into the book the teacher would lead a group discussion based on the reading. This discussion would discuss the book’s plot as well as students’ personal opinions. Teachers should ask students what they thought of the rules and way of life described in the novel. They would answer questions such as, “What do you think is the reasoning behind their system? Why do you think they have eliminated things such as color, emotion, and choice? What would you change? What is your idea of a fair utopian society? What do you think are the downfalls of this society structure?” This activity would allow students to think in abstract terms. It will require the students to develop hypotheses about the cause and effects of such a society. It would also require them to imagine their own ideal society. 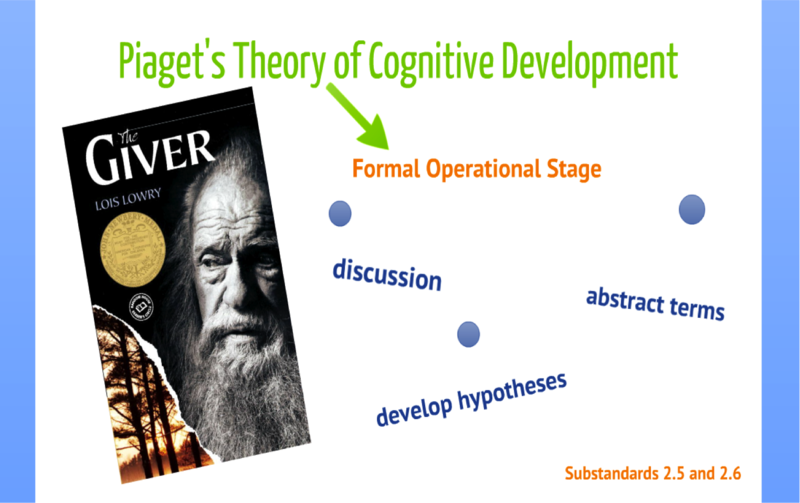 Thinking abstractly, hypothesizing, and considering the future are all components of the formal operational stage.